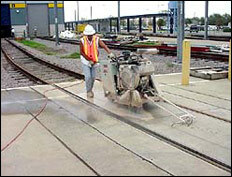 Sawing horizontal concrete surfaces (flat sawing) has become a very sophisticated process. High powered, lightweight saws have multiplied production rates by 5 times over the last few years. 400Hz electric saws permit sawing to be done inside buildings without dangerous fumes. Concrete Coring Company has developed specially equipped trucks and unique dispatching techniques to additionally increase production. With these developments, the cost of flat sawing has been reduced to a level competitive with other removal methods. 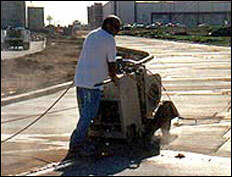 Flat sawing completely through 24 inch thick asphalt or concrete sheets or bridges is very common today. Streets no longer need to be broken or damaged with drop-hammers, and concrete flat sawing is often written into specifications due to its vibration-free, clean operation and ease of patching. Inside cutting work accomplished with electric flat saws is now also routine. People need not be disturbed with noise nor building interiors filled with dust, when concrete sawing is used for building modifications.